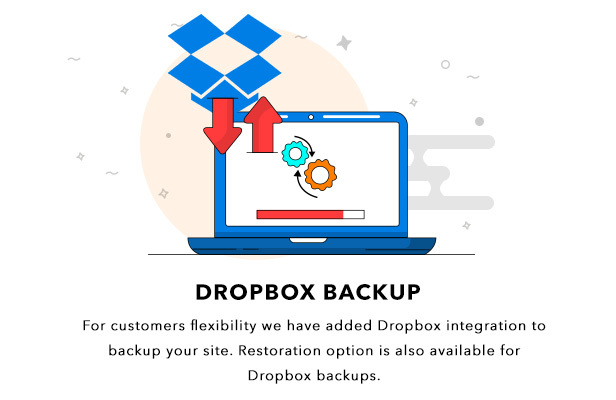 Backup of WordPress site via Dropbox plugin is all-in-one solution for WordPress backup, restoration and cloning. This plugin helps you to manage the above processes in a secure, easy, and reliable way on a scheduled or on-demand basis. Cloning ability is especially valuable when you are running multiple WordPress sites. It could be a time consuming project to configure WordPress, install and customize theme, install and configure multiple plugins, which is usually the same setup for all of your websites. Plugin provides secure protection for WordPress sites and their data. You invest a great amount of time into your website, and it is essential to make sure your data is safe. With regular auto backups created, you don’t need to worry about data loss in case of server injections, software upgrades, or site changes. This extension will takes care of the backups, and lets you restore your site in one click, which will definitely bring you peace of mind and added safety. Backup needed before any updation is going to process at your site and similarly you need restoration point from where you can restore on any trouble or in case to acheive old data. Dropbox the secure location for your data, they promise to keep your data safe and they dont use your personal data to put ads. You can access your files without being online, which means you can always have your most important files with you. 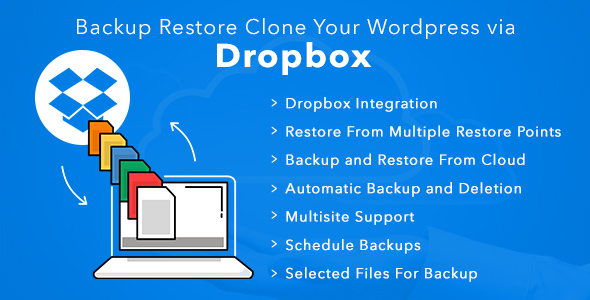 Backup Restore Clone your WordPress via Dropbox help to make the whole site is a backup along with database on the local server. It also displays total size of total local backup and number of restore points created. In quick backup, only the files which are modified after the last backup was considered for backup. It also displays information regarding the total size and a total number of restore points. You can download your wordpress site in .zip format and date in .sql format. You can take a full backup of your site with the database on Dropbox, you have to provide correct credentials. You mainly have to provide Dropbox API key, Dropbox API Secret, and Dropbox Access Token. A notification email is sent regarding the disk space available on the Server to admin. The site owner is aware of Disk space available on the server. Setting enables to delete backup automatically after a scheduled time or after specific numbers of backup. This saves site owner time from removing old backup as well as solve the headache of Server’s Disk Space issue. All backups are listed in different section according to the location where the backup is taken in tabular form. During restoration perfect view of selecting the correct backup and restore your site on single click. Restore the site on the crash. Site Owner can easily restore the site without accessing the dashboard. Plugin provides CRASH KEY, You need to keep it safe and use this when your site crashed to restore your site again. An ultimate feature is added to take backup and restore. Each SubSite Owner can easily take backup of their subsite. A multisite Network administrator has the capability to take backup of any subsite. Settings where Dropbox API details need to enter and ready for data storage and restoration process. To take backup is a collective statement means you are discussing about complete backup, but in case if you need backup of selected directories or plugins or only particular theme. This plugin provides you the best way to choose the directories to take backup, So, when backup query fires only those directories backup will save. Setting enables to delete backup automatically after a scheduled time or after specific numbers of backup. Setting for Enable/Disable auto deletion. Time-based: Execute auto delete after a specific interval of time. Frequency based: Execute auto delete when backups are reached to a specific number provided by the admin. Enable/Disable setting to delete server backups. Notification of space sends to mail as admin provides in percentage. There are options to schedule your backup on the basis of time and event. You can schedule your backup timely(Weekly, Daily, Monthly) and you have to sit back and wait at the time of scheduled backup. You can schedule your backup on plugin activation, plugin deactivation, and theme activation. In this section, all backups which are scheduled on timely basis are displayed with following options. It is the hook on which the backup us scheduled. It is the type of backup i.e. on which server backup is taken(Local, Dropbox). The actual time at which the backup is scheduled. PHP version 5.5.6 or greater. CURL extension must be installed. Zip extension must be installed. Thank-you for your interest in Backup Restore Clone Your WordPress via Dropbox, Makewebbetter. We do our best to ensure that our clients receive the utmost satisfaction in return for their patronage. And we are willing to go to great lengths to answer queries, modify products and so on, for our clients. Please feel free to ask any pre-sale questions. Take your time before the purchase and confirm everything including compatibility, usability and so on by engaging in conversation with our ever ready support team, before making the purchase. Do not ask for refund if you are expecting any feature not mentioned on product page or not confirmed by our support team in pre-sale conversation, as it will demotivate us despite of all our hard work and help.